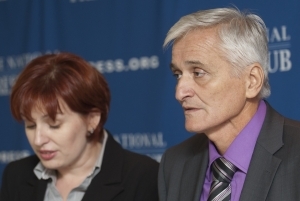 Bosnia and Herzegovina is successfully rebuilding after years of conflict by establishing trust among three factions "only recently at war with one another, Prime Minister Nikola Spiric said at a Sept. 26 Newsmaker event. Bosnia and Herzegovina has signed the Stabilization and Association Agreement with the European Union, joined the NATO Membership Action Plan and is a non-permanent member of the United Nations Security Council. Spiric said Bosnia and Herzegovina considers EU membership one of its "most important and highest-priority strategic aims." He added that "it is only from within the EU that we can fundamentally preserve and build upon our identities." He said the nation is disheartened by delays in the EU's expansion that would enable Bosnia and Herzegovina to join. Only when the entire region is fully integrated into the EU, Spiric said, "will the people who call the Balkans their common home be able to thrive economically and experience social security." And it is only then, he added, "that we will be able to turn the page on our dismal past." Another primary foreign policy aim of Bosnia and Herzegovina, the prime minister said, is is "continued integration into NATO." This commitment was formally endorsed, he noted, when the country was admitted to the NATO Membership Action Plan. "We have grown from a consumer of peacekeeping resources to an ally ready to...support peacekeeping operations throughout the world." Spiric added that his country is also aware that the process of integration into NATO involved "not only military and defense issues, but a much wider range of activities."